Many of us spend a lot of time doing—doing work, doing errands, doing for others. Sometimes we need to stop our to-dos and just be. With Inkspirations Mindful Living, you can sink into that much-needed respite from the busyness of life, transforming your free time into mindful 'me' time. It's not just fun and nostalgic. Studies show that mindfulness may help to improve your working memory, decrease stress, and boost your immune system. Artist Judy Clement Wall specially designed each page to foster a sense of calm while stirring your creativity. You'll find an assortment of symmetrical patterns and mandalas as well as flowers, nature scenes, and animals just waiting to be embellished, plus thought-provoking quotes to uplift and inspire you. Printed on perforated paper for easy tearing and sharing, and with a special lay-flat binding, Inkspirations Mindful Living offers you hours of engaging fun and artful exploration. Unplug, unwind, and unleash your creativity on every page while you sink into the moment--your moment. 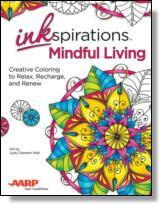 AARP and HCI Books have come together with a special line of Inkspirations adult coloring books that are good for our hearts, our minds, and our souls—benefitting us emotionally, physically, and spiritually. Life moves at warp speed, and we all can use some space to breathe. Many of us are masters of multitasking—masters of doing—so it's difficult to slow down and just be. And we're constantly immersed in technology and dinging digital devices demanding our attention, making it difficult to unplug. Coloring offers an enjoyable way to slow down and reconnect with your creative, playful side. Remember as a kid spending hours coloring with a big box of crayons? In that same way, many adults are losing themselves in coloring because it's restorative to their spirits. Coloring instills a sense of peace. It allows you to free your mind of worries and focus your attention on the present moment, which leads to a state of mindfulness. And—it turns out—coloring is good for your mind, your body, and your soul. While it can take years to fully master mindfulness, it begins with intention. Being more mindful means acting with more kindness and compassion (even toward ourselves), slowing down to enjoy the simple moments, accepting the moment as it is, and seeing the beauty in the ordinary. Coloring is a perfect exercise in mindfulness. It's not about producing a perfect page; it's about slowing down, connecting to the moment, and taking time to let go and create without being attached to the outcome. Illustrator Judy Clement Wall designed each page in this book to instill a sense of relaxation. 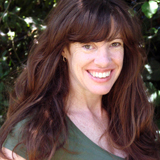 You'll find several mandalas, which have been used in many cultures and therapeutic settings to help quiet the mind. You'll also find a range of designs, from simpler ones that can be colored in less time to more intricate patterned pages. Each image is paired with a quote that conveys a key principle of living mindfully, from acceptance to awareness, from compassion to letting go, from quieting the mind to being open to new possibilities. May the quotes and images inspire you to savor each moment and find a restorative way to recharge so you can make each day a masterpiece. Unplug, unwind, and let your artistry bloom. ©2016 HCI Books. All rights reserved. Reprinted from Inkspirations Mindful Living: Creative Coloring to Relax, Recharge, and Renew. No part of this publication may be reproduced, stored in a retrieval system or transmitted in any form or by any means, without the written permission of the publisher. Publisher: Health Communications, Inc., 3201 SW 15th Street, Deerfield Beach, FL 33442.